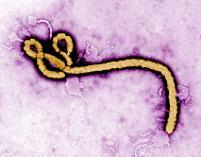 There must be few diseases that can conjure up images of horror the way Ebola virus can. Since it was first identified in Zaire (now the Democratic Republic of the Congo) in the mid-1970’s there have been several outbreaks that have left hundreds of people dead, but it is the potential for far worse outbreaks that has epidemiologists worried. Ebola infection causes a viral hemorrhagic fever characterised by rapid onset of fever, followed within days by vomiting and diarrhea, and eventually bleeding from bodily orifices and injection sites; mortality varies between 50 and 90% depending on the strain of Ebola. There is no specific treatment or cure available for Ebola virus, although through research on mice and guinea pigs scientists at the U.S. Army Medical Research Institute of Infectious Diseases developed a morpholino based treatment that protected 75% of rhesus monkeys exposed to Ebola virus. Subsequent studies showed that these morpholino based therapies – AVI-6002 and AVI-6003 – could confer protection against Ebola and Marburg viruses respectively when administered within an hour of infection, and further studies are under way to determine if they can offer protection when administered later. While efforts to improve the efficiency of this treatment are ongoing other scientists have turned to developing a vaccine against Ebola virus. So far we have been quite lucky with Ebola, most outbreaks have occurred in remote areas and due to the rapid progression of the disease – and the fact that no strains have been capable of airborne infection – the outbreaks have tended to burn themselves out quite quickly once travel restrictions and containment protocols were implemented, but we can’t rely on being lucky forever. A difficulty with designing vaccines against Ebola is that the antibody-producing B-cells of the immune system that many vaccines stimulate can only recognize one strain at a time, so for each new strain of Ebola that emerges you would need a new vaccine. This would obviously result in a significant delay between reporting of an outbreak and getting the vaccine into the areas where it’s needed, so scientists have been studying another vaccination strategy that stimulates the cellular arm of the immune system that is capable of recognizing a wider range of virus strains. The two part “Prime-Boost” strategy they developed involves first administering a “prime”, a DNA vaccine that codes for part of the surface proteins of the “Zaire” and “Sudan” strains of Ebola, followed several months later by administration of a “boost” vaccine based on a weakened adenovirus (cold virus) that also produces fragments of the Ebola surface proteins that are then recognized as foreign by the immune system. This strategy successfully protected cynomolgus macaques from the Zaire strain of Ebola virus (1) and has since been shown to be safe to stimulate an immune response in small scale human trials (2). The question remained as to whether this vaccine strategy would be able to protect against Ebola strains other than “Zaire” and “Sudan”, and the opportunity to test this came in 2007 when a new strain of Ebola was identified in the Bundibugyo region of Uganda. The outbreak burnt itself out before any program of vaccination could be implemented, but the new strain did offer the opportunity to re-evaluate the prime-boost vaccination strategy. In a report, published yesterday in the open access journal PloS Pathogens, Dr Nancy J. Sullivan and colleagues at the National Institute of Allergy and Infectious Diseases report that the prime-boost strategy can protect cynomolgus macaques from the otherwise fatal Bundibugyo Ebola virus, demonstrating that it can protect against several different strains of the disease. This is great news and brings us a lot closer to the goal of a vaccine that can protect us against Ebola virus, in particular it is possible that this vaccine could be used to immunize people living in areas where Ebola is a threat even before an outbreak is detected. It is not just humans who may benefit from this vaccine research, in the past decade tens of thousands of chimpanzees and gorillas have died from Ebola, and the disease now poses a significant threat to the their very survival. A vaccine against Ebola would help reduce death toll among these endangered apes, though even with an effective vaccine developing and implementing a successful immunization program will be neither cheap nor easy.